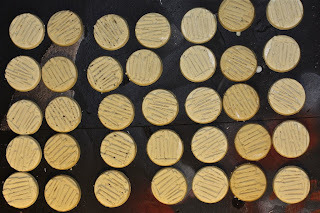 Some days I just feel like dry brushing. 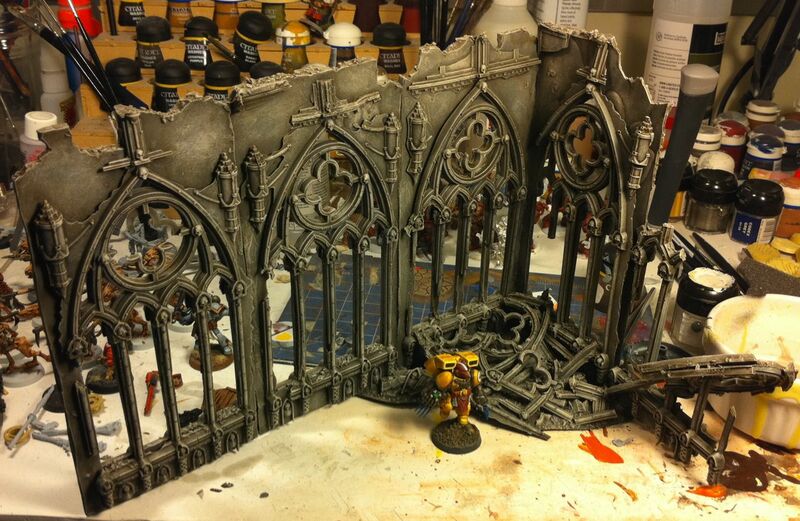 I cast this neat little scenery bit a while back when I was learning how to make my own stuff. After a disastrous home made wash, I put the model aside and left it sitting forlorn at the edge of my painting area. A little dry brushing of deheneb stone, and it is looking passible. I am considering sculpting my own ruined city apt blocks so the game has a war torn ww2 look. 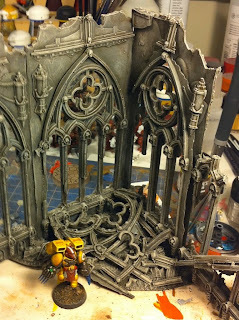 The best part of casting is that I can easily make piles of interesting building rubble. Is there a piece of scenery that anyone would like to see made? I could make some custom buildings, bridges, or anything else easily cast in a one piece mold. I'd gladly make the best idea. I tried my hand at yellow again. I used sunburst yellow over white primer followed by sepia wash, highlighted with bad moon yellow and then given a bath in yellow ink. It did not work as I expected. (I'm also using a camera phone for my photos right now) I chest and knee pads look particularly bad. In person the top of the jump pack looks pretty good, as does the mini from the back. One of the questions you might ask, is why make a counts as shrike for an army you don't have? I have no answer. 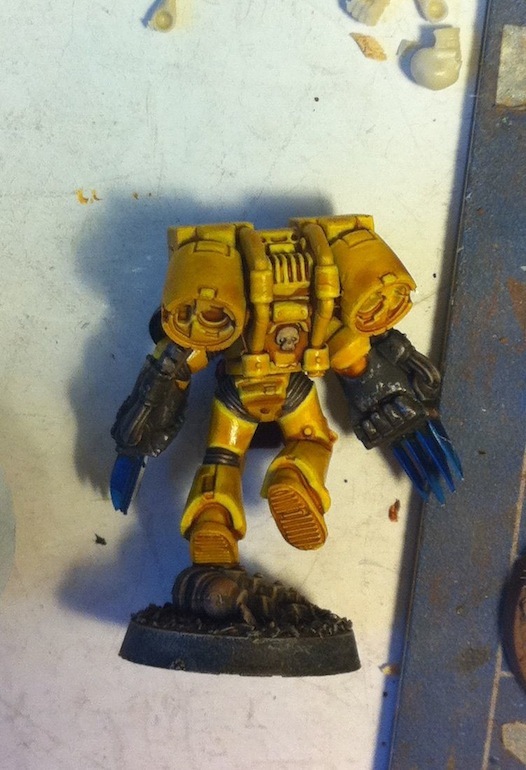 I just wanted an imperial fist, and I don't have a shrike. 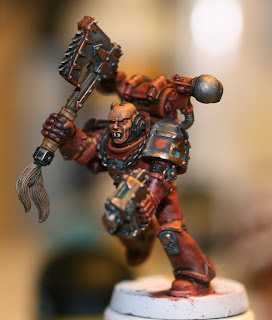 I've got to at least try each of the GW transfers once right! The last photo is of a centaur assault vehicle. 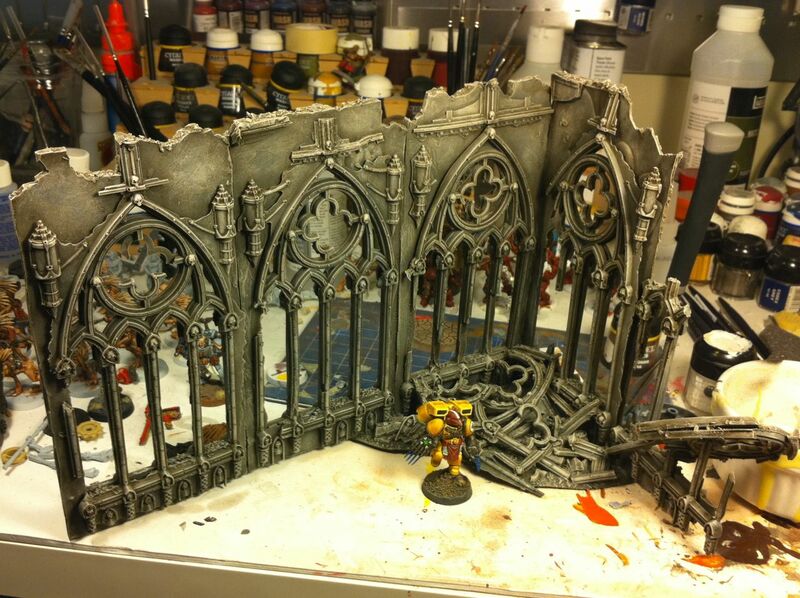 I am really excited to paint this up. I am thinking about having my krieg vehicles a minty green color, and let the troops be grey and brown. 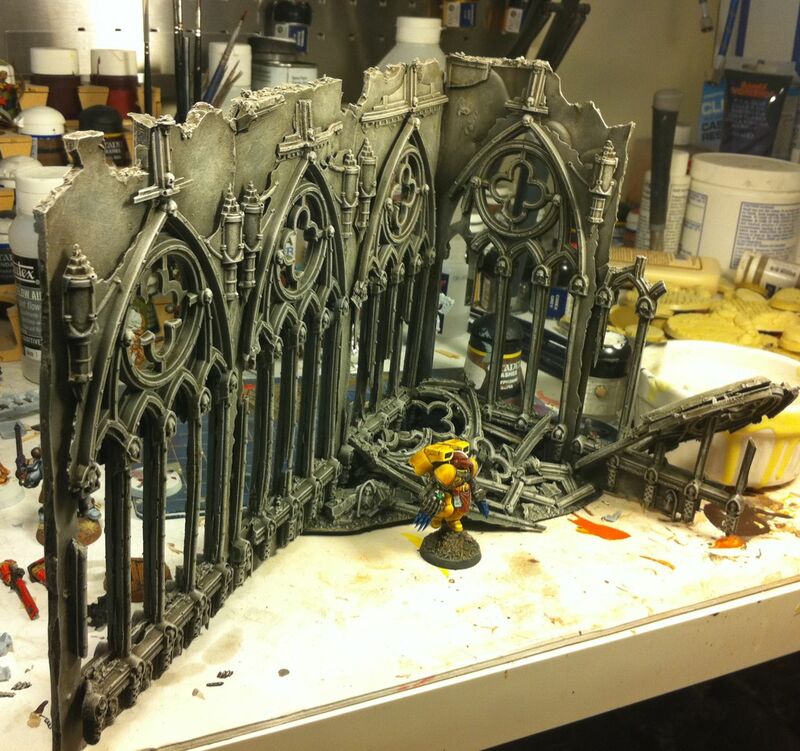 I think it would look striking on the table. I have loads of stuff I want to post about gamesday 2010, but instead of posting, I have been experimenting with new ways to paint. 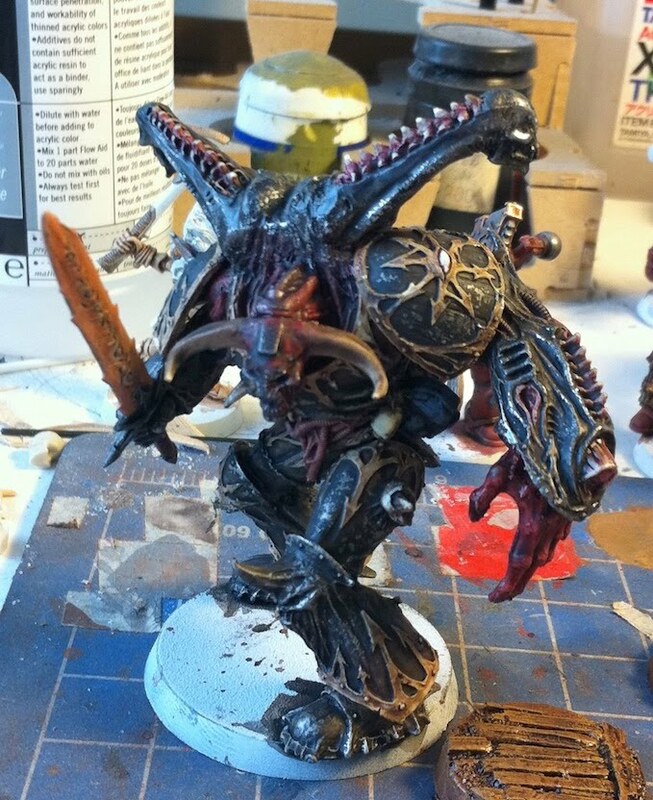 I've had a demon prince sitting on my painting table for almost a year now, and I decided it would make a good test case for painting with washes. 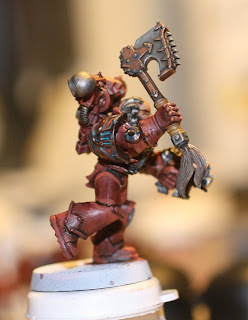 The black armor of the kroot turned out out really nice, so the only real change was figuring out how to blend the blood red wash into the black to the armor transitioned from metal to flesh. I don't know how I feel about the paint job. The sword I just tossed some paint on, and it shows, but the armor is really interesting in person. I love the way the white undercoat+ sepia made the black legion yellow trim look. 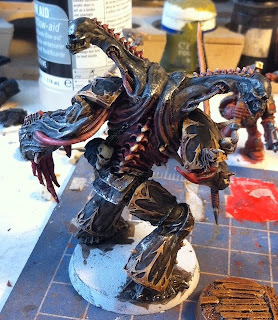 I feel like painting a Titan this way....oops.. yep. That's right, I bought a Titan at GD2010. Everyone I know is giving me crap about it. I can't describe it. I have wanted to paint one for ages, and having them so accessible weakened my resolve. Now I have to do it justice. Some combination of masking, and airbrushing is needed. 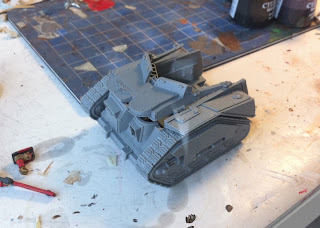 I have an imperial warhound that is just crying out for the forgeworld masterclass treatment. Base colors, plus oil paints, paint chipping, greasy oil stains ect..... going to be loads of fun. 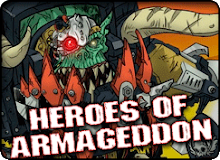 Oh, and just to add a little gamesday blurb.... I dropped one of Lunchbox's miniatures and broke it. Yep, you heard it right. 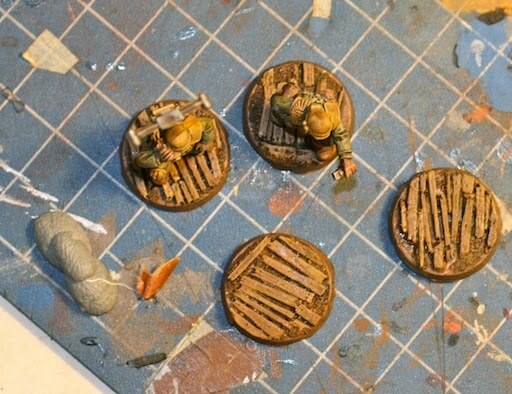 I dropped one of the miniatures from my favorite painter. The weird part of the story is that it took me a good 10 minutes before I connected the real live person and models with the username+photos online. He was so cool, and assured me that it was not a big deal. I'll have to post some photos of his Emperors Storm army. It is simply amazing. I know most of the Storm Wardens are going to be at Games Day in force, and I look forward to hanging out with them at the Fritz & Jawaballs club table. I can't wait to see the army all together on the table. That might be reason enough to bring a small army so I can challenge the new owner to quick match! 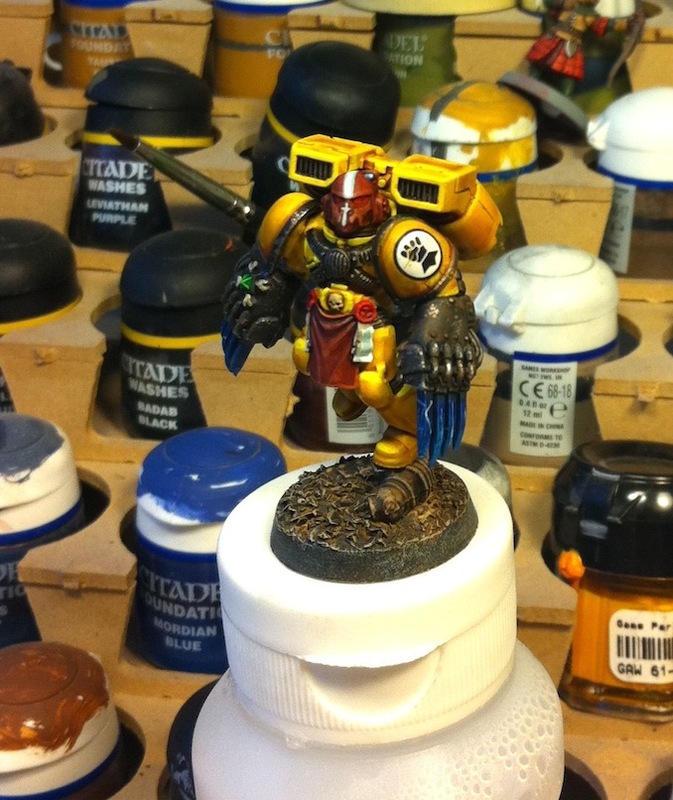 Of course the army has to be alien, otherwise the whole deathwatch thing is moot. I guess I better paint up a couple more dozen tau. The painting and conversion competitions look a lot of fun, and I can't disguise the joy that comes from knowing forgeworld goodies will be available. I just bought 60 of the various pre-heresy marines, so my wife and the bank may not be so forgiving if I buy more. I will buy more though. That is almost a given. Does this mean I am a collector and not a gamer? I read YTTH and other tactical blogs but it is mainly out of curiosity. Watching the internet personalities duke it out can be fun. 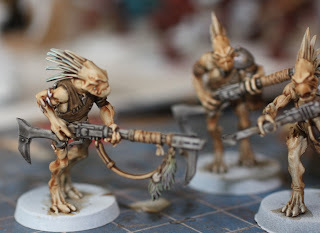 While waiting to watch True Blood with my wife I churned out 2 Kroot hounds and a handful more kroot warriors. 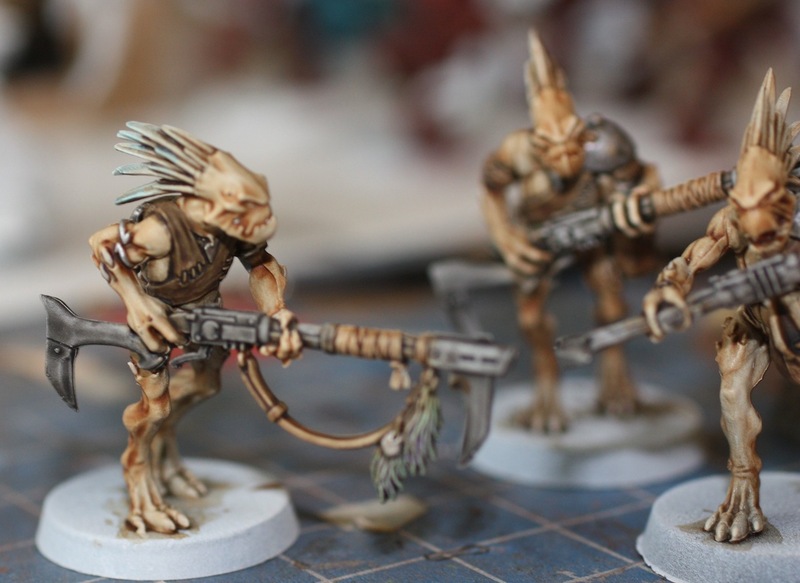 I will put up some WIP shots of the remaining three Kroot warriors. 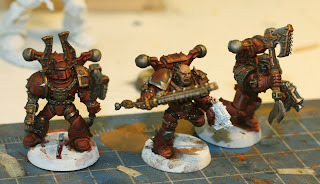 The painting method is just so fast, that I had these guys done before I had read the reply asking for a tutorial. I pulled three models aside just in time, otherwise they would all be done! 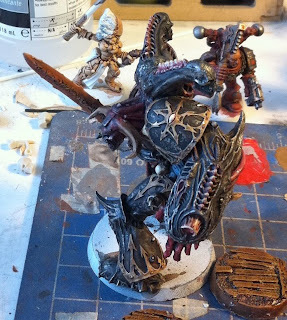 I think I am going to paint up another set of these guys. 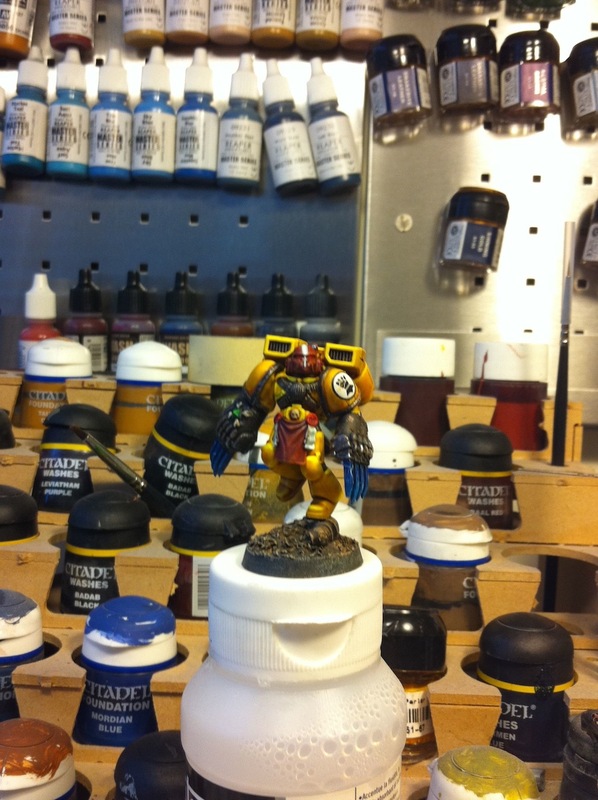 I don't have a painted tau army, but maybe I can get 500 pts painted up before Gamesday. That would give me something to throw against the rest of the storm wardens crew! 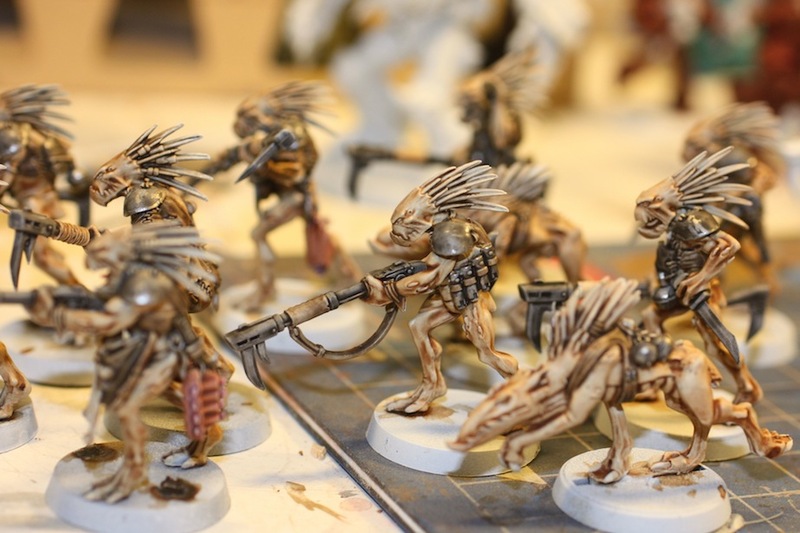 Right in the middle of painting the Khorne Berzerkers up I decided to paint some Kroot. 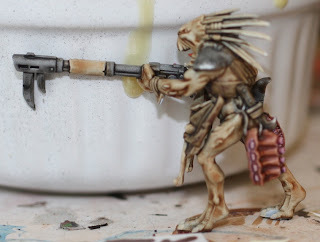 A while back I found a posting from a guy who had painted some amazing Death Korps of Krieg troops using primarily washes. Since have yet another order to DKK crack coming in, I thought I should overcome my fear of painting such expensive models. 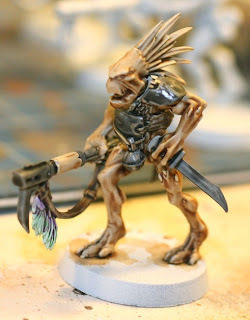 Naturally I picked Kroot as my inexpensive test figures. I love painting them. I could paint 50 of these in a day. 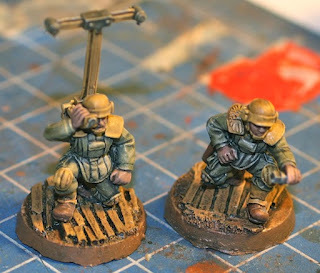 They painted using mostly washes. The 4 I painted took around 20 minutes. I think the best part is that I can imagine getting a load of these painted up with just two coats of the washes, and then just saving the rest the details for later. This way a giant squad could be pumped out in a single afternoon. 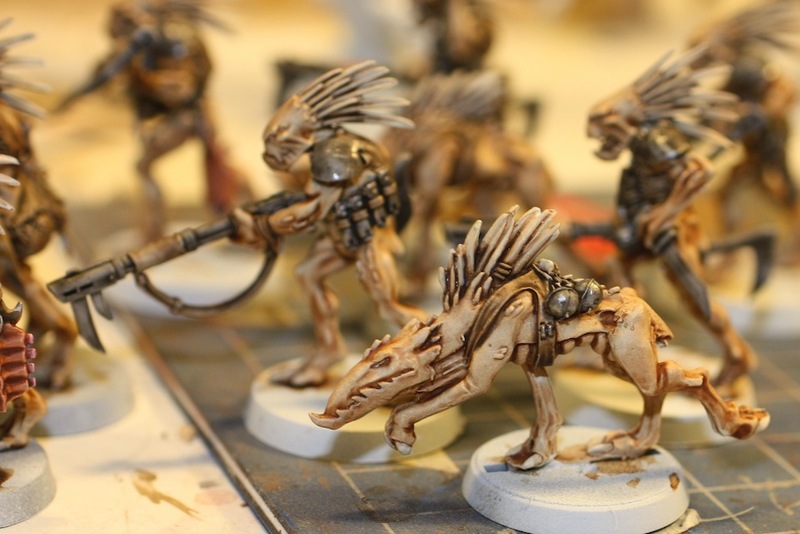 The hardest part about painting these guys......having enough glued together to fill the painting queue. 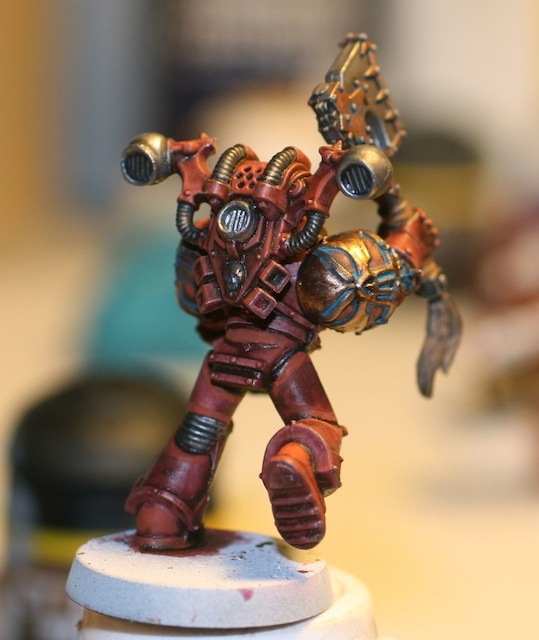 Ever get the desire to just throw some paint down, to not care about careful blending or composition? 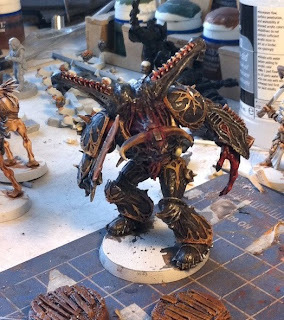 I've had eight Khorne Bezerkers hanging out on my painting table for ages, and I just felt the need to paint without restriction. These miniatures are textbook un-eveness. I painted what I wanted to paint. I doused the whole miniature in a homemade wash that left gunk in all the cracks and I just don't care. 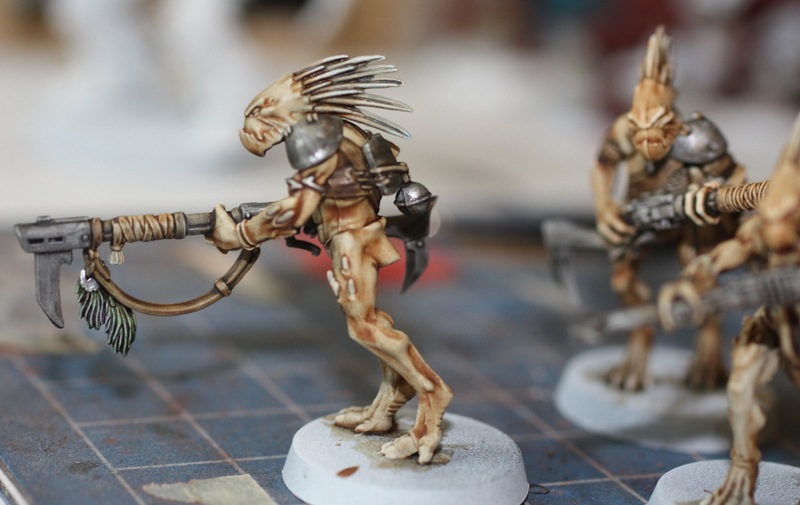 I am having so much fun painting these guys, that at some point I may feel the need to paint more to show the world what I can do technically. Right now I am just painting for speed, fun, and experimentation with random techniques. Isn't this what painting is supposed to be about in the first place? I tried out a quick and dirty paint job on my resin bases today. 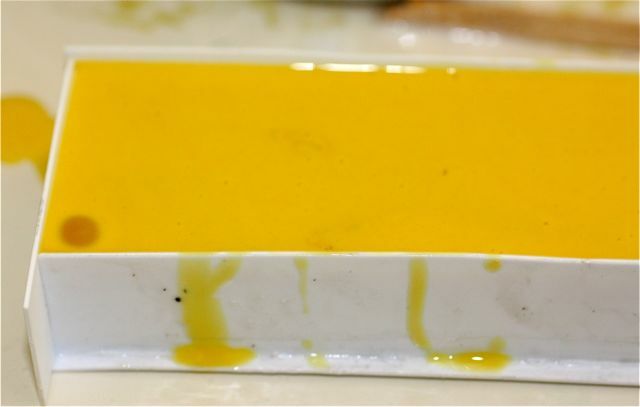 Brown, Dev Mud, and then that Tau yellow color make up the recipe. Now that I can whip up 5 bases to try out new paint schemes on in under 10 minutes trying new paint schemes does not feel wasteful. There is none of that stress that comes from potentially ruining a nice miniature or base when I can just cast a duplicate and try again. I plan to use these bases with my death corps, so there there will be more color difference between the models and the bases than is show in this photo. The goal is to have a warm muddy base paired with cool green or grey toned Death Korps. 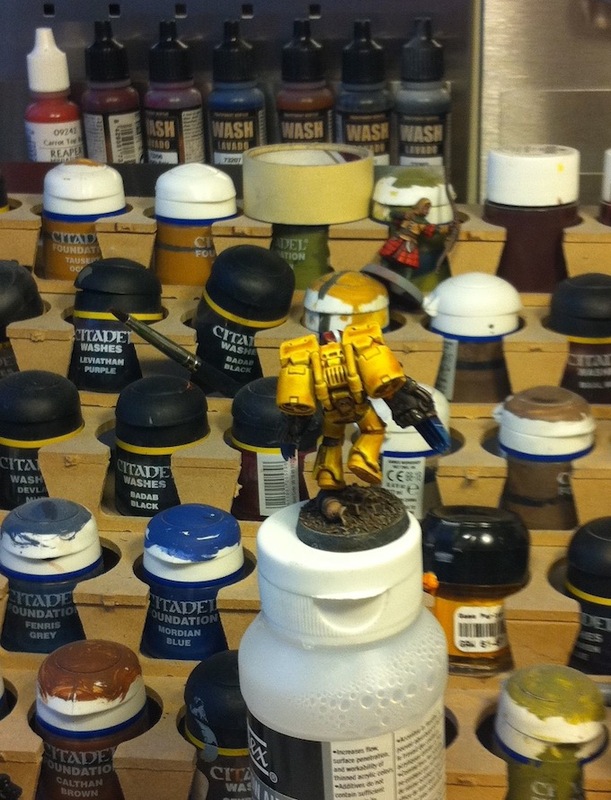 You can see my sand bags curing on the cutting board to the left of the miniatures. These are being created for the larger weapon team bases I am working on. 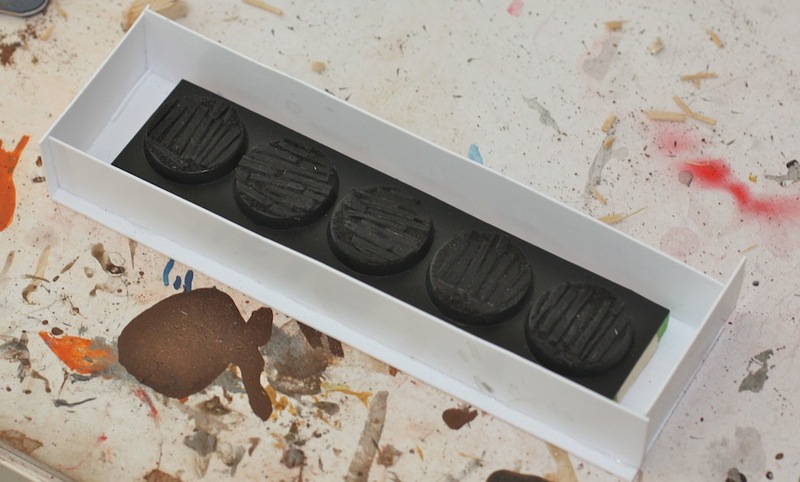 A while back I created some press molds to make some green stuff bases for my Blood Angels/Grey Knights armies. 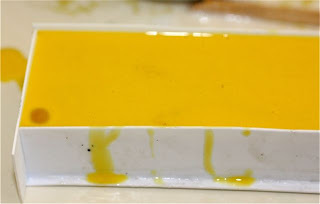 Since then I have walked the way of resin! While prepping the images for this post, I cast 25 resin trench bases. 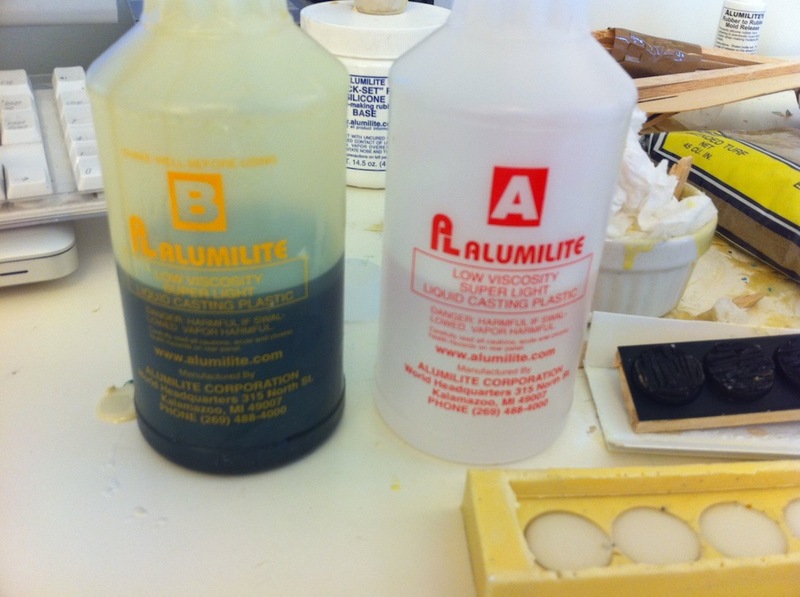 The coolest part about this process is that it is dirt simple. 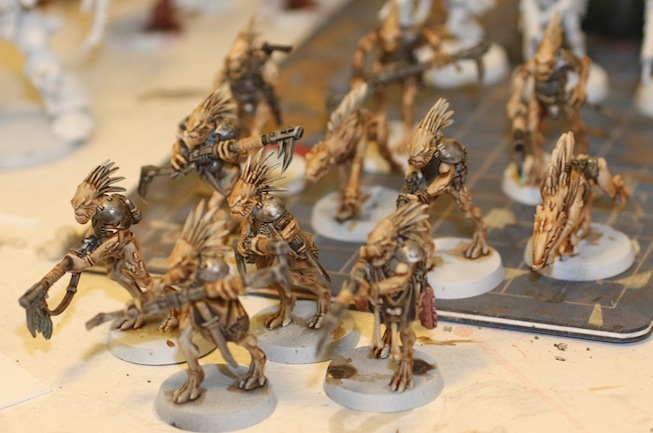 I can completely re-theme an army by creating cool new bases, and then mass producing them. The bases you see here are for my Death Korps of Krieg army. You should go online and buy the starter kit from Alumilite. Seriously...do it now.